It's more than a month now since we lost our fur baby Lucio, he died because of renal failure. The first time we saw some problems in him, was during the time my son was vacationing in the Philippines. We noticed that he urinates frequently and in small amounts only, thus we brought him to his Vet who recommended him to have a complete blood test. That time, we made a wrong decision because we thought that his illness was not that serious and maybe just a normal UTI, so we urged the Vet to just prescribe an appropriate antibiotic for Lucio which she did. After that medication, we noticed a slight improvement in him. A couple of months after that, we noticed again that he is having some difficulty urinating. This observation was followed by his becoming less active than before and suddenly, he lost his appetite and would not eat anything for 3 straight days. That was the time that we get alarmed. We brought him again to the Vet for the complete blood test. The result was so alarming as he was right then and there diagnosed with chronic kidney problem with complications in liver. We were so saddened by the Vet's findings and asked them on what should be the best thing to do to save Lucio. He was confined in the clinic for several days, but he won't eat anything. He was subjected to forced feeding and had a dextrose for fluid retention. The situation continued to worsen and we told the Vet to do every possible remedy to save him. We bough him injectable medications hoping that he would recuperate from the disease. We have high hopes that he would get better and that we could spend more time with him even for a year or two. Until one day, we sought a second opinion from another Vet from which we were apprised of the same findings and we were told that Lucio has a very slim chance of surviving. As soon as we went home that day, we called my son and discussed to him Lucio's situation. I told him that we need to slowly accept that Lucio would no longer be with us soon. I could also see how Lucio suffer, he's getting weaker each day and no longer responding to his medications. We blamed ourselves for not being attentive on the first instance of him showing some irregular signs. We blamed ourselves for not allowing him to be subjected to a complete blood test the first time we were advised to do so. We were deeply devastated by the fact that we had our own share of shortcomings. Lucio was our very first house pet which I bought as a gift for my daughter's birthday. Lucio has a very bad temper and would not show his sweetness to us most of the times but he would suddenly be extra sweet when he is on his best mood. In fact, he was my son's favorite among all our pets. We can rely on him more than anybody else in protecting our home. He got a strong sense of smell and would detect any stranger walking outside the yard in an instant. When that happens, he would bark non stop and appears to be very angry and this would definitely drive strangers away. Now, our Lucio was gone. His Vet called us the day after we talked about his condition and accepted his fate. We were informed that he already passed away in the clinic. We all cried out of devastation and sadness. 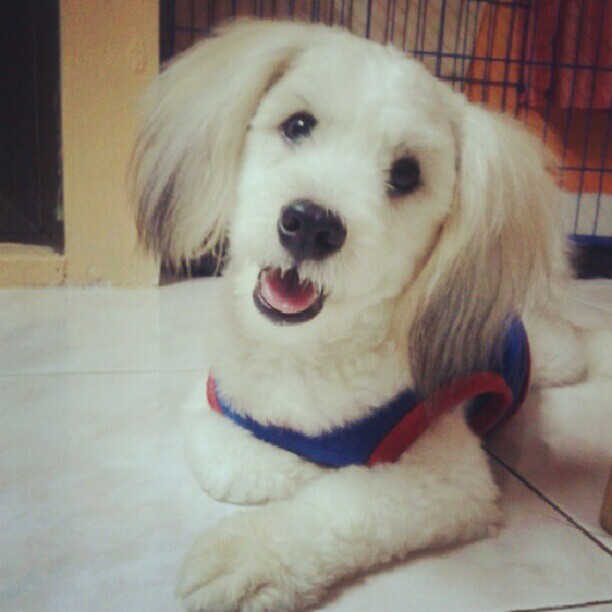 How can we lost a very gorgeous,sweet and dependable pet like him. His lost is something that was unbearable at first. We all treated him as a family the way we treat the rest of our pets at home and it's not easy to lose someone like him whom we love so dearly, but sometimes good things should come to an end. We may have lost him but he would definitely remain in our hearts forever. Farewell my dear Lucio! We love you to the moon and back!